The HB-R-SDI offers an easy solution for extending SDI signals up to 100 meters over Cat 5 (or better) cable, utilizing the industry standard HDBaseT protocol. Bi-directional IR and RS-232 for device control is also supported, making these Mini-Converters ideal in a variety of scenarios including: fixed installation AV, digital signage, live events, postproduction/network/studio environments and on-set. 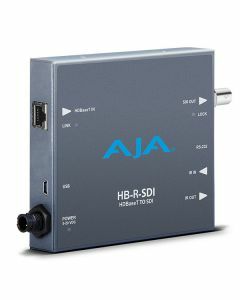 AJA’s HDBaseT line of Mini-Converters offer an easy solution for extending video signals up to 100 meters over Cat 5 (or better) cable, utilizing the industry standard HDBaseT protocol. Bidirectional IR and RS-232 for device control is also supported, making these Mini-Converters ideal in a variety of scenarios including: fixed installation AV, digital signage, live events, postproduction/network/studio environments and on-set.